fixBuffalo readers alerted me this morning to the collapse of the Church of the Sacred Heart's school building's north wall. Compounded by the recent wind storm, 25 years of neglect contributed to the dangerous conditions here on Emslie Street near Clinton (live map). The school building has been collapsing for years, the rectory and convent seem to be in better structural shape than the church. By early afternoon City crews, aided by the fire department taped off the area and placed plastic barriers around the site. Chris Hawley from the East side's coolest new blog, The Hydraulics posted about the bad news. A quick scan of Housing Court records reveals that the owners have been in court for the past 8 years. 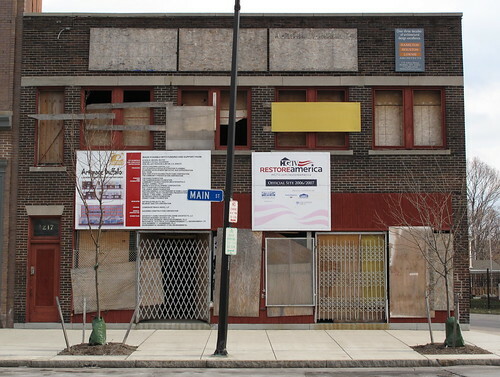 Here's that record for the four buildings that comprise this forgotten part of Buffalo's cultural heritage. 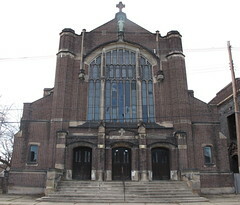 The Church of the Sacred Heart has been a frequent stop on the Tour d'Neglect in recent years. Preservation Buffalo Niagara has additional information about the history of the site - right here. Buffalo's ABC affiliate, wkbw was at the scene today. Here's that report and short video. While the future of the school building remains uncertain, attention and resources should be focused on the Catholic complex's other three buildings - which are also in Housing Court. 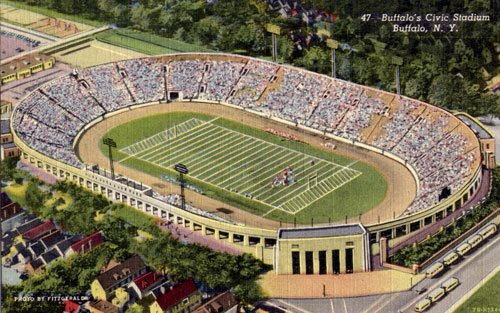 While cruising this post - I've been Waiting for Tomorrow (all of my life) - over at Roam Buffalo the other day I found this vintage postcard of the Rockpile - aka War Memorial Stadium and Civic Stadium - which was located just a few blocks away down Masten Avenue. In the same post, I checked out The Ol' Rockpile for the first time. Really amazing social history and pics from back in the day. Ask anybody from Western New York old enough to remember the Nixon Administration, the war in Viet Nam, Republic Steel in South Buffalo or Woodstock (the first one) and I'm sure they'll have some kind of a story about War Memorial Stadium, or as it was commonly known, "The Rockpile." Originally named Civic Stadium, the Rockpile was built as a WPA project, a federally funded make work program administered by President Franklin D. Roosevelt during the depression. Construction started in 1935 - read the rest. I vaguely remember hanging out here once during the summer of 1987 for a Bisons game. A couple years ago I found a book about Buffalo's Catholic heritage with a number of pics from Civic Stadium during the Fall of 1948 - right here. Over at Historic Aerials, I've pinpointed the Rockpile in a 1959 moment - right here. There's an interesting feature embedded in this map that allows you to use a slider, fading between two different years. Click on the 'compare two years' button when you follow that link. Try picking 1959 and 2006...crazy, right? There are times when I walk the neighborhood at night, especially the seven blocks along Masten, between the Rockpile and where Offermann Stadium once stood, and I wonder and ask myself...how did it all disappear so fast? I received a copy of my new city property tax assesment recently...a 25% increase, going forward. When I bought my house 12 years ago - for $1 - it carried a 30K assesment. Every year for the next 6 I challenged the assesment and helped numerous neighbors challenge there's, too. Gradually, I whittled the assesment to 18K, which I still think is high based on the number of City owned vacant properties and the numbers that I keep track of regarding recent sales here in Cold Springs. In any case, I just downloaded the forms that I'll complete later tonite and mail off to City Hall tomorrow to challenge the whopping 25% increase. Here's the link on the City's site - right here - to download the four page form. Forms must be post-marked by December 31st in order to challenge the City's new assesment. I'll make sure to do a follow-up post in the first quarter with the City's results. I stumbled upon Roam Buffalo the other day, an amazing Buffalo based blog. Jill and Mark collaborate on this and have linked to a growing collection of 20th century images that will resonate with Buffalo fans here and in diaspora. I just cruised through back issues of Slack Magazine that I found on Roaming Buffalo and found some crazy images of Buffalo...from back in the day. 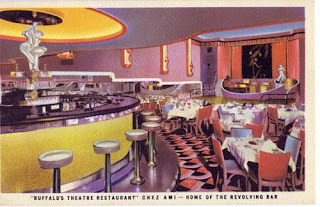 Great collection of vintage postcards in various posts. 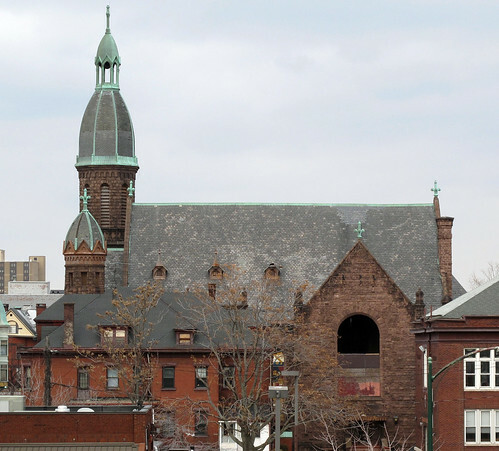 Two additional Buffalo blogs caught my eye this week - WNY Book Arts and Abbey over Aesthetic Outburst linked to my post about the coolest Main Street lofts recently, here. I've added all three to my list of daily reads. If you're interest in Buffalo, you won't want to miss Forgotten Buffalo. There's an amazing collection of pics and memories of neigbhorhoods and some amazing moments involving the City's broadcast history. Best guide to some of the least known bars and taverns in the City, including a favorite of mine down on Hamburg Street - McCarthey's. The Forgotten Buffalo Tours are always sold out. Just got word today that they've added another bus for the Polish Tavern Christmas Tour, scheduled for Friday December 19th. The Buffalo Flickr group is home to 11,000+ shots of Buffalo. Here's the never ending slide show. One of my favorite shots of City Hall includes Kenneth Snelson's Coronation Day - my favorite sculpture in the City - that was installed in 1980. You can check out all of Poetdiva's work - here. How do you preserve a magnificent national landscape by promoting city living? That's the mission of The Cascade Land Conservancy, which is working to make Seattle appealing so that sprawl doesn't consume the Cascade Mountains that surround the city. We've got two guests from the Conservancy who will tell us what it does, and how it works with developers, loggers and a community to help save the cascade landscape. And the world of public planning can sometimes seem closed off to the average citizen. Deb Ryan of the University of North Carolina Charlotte is looking to change that. She's created a virtual collaboration tool called Wikiplanning , which she presented during the Urban 20x20 event before the CEOs for Cities National Meeting last month. We'll talk to Deb about creating a place where citizens can weigh in on the future of their city, and how it all works. Renovations began months ago at the corner of Main and Riley. 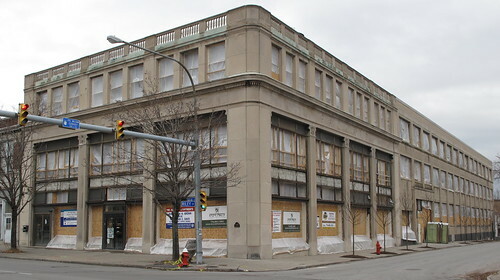 The former Packard automobile showroom here in Midtown is the latest building to be converted to apartments. The first, two blocks away, was Artspace that I've been following for years. 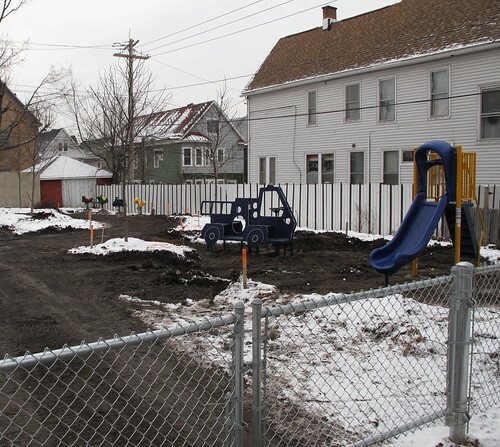 Yesterday I noticed that the new 'pocket park' located behind thePackard at the end of Ellicott Street is beginning to take shape with the installation of some playground equiptment and a new cyclone fence. The location of this new 'pocket park' is clearly shown on the HHL plan - right here. Across the street on the St. Vincent's block there appears to be a new parking lot that's been fenced and 'greened' for the project. Here's the project description from the Hamilton Houston Lownie site, the project's architects. 40 apartments will fill this space and according to the signs, pre-renting is happening right now. Consider meeting up with a few other fixBuffalo readers next Saturday for the season's last Neighborhood Walk, we'll be checking out the latest developments here on Riley Street. Here's the schedule and flickr series from a few recent walks. I received the following - For Modern Urban Growth - Don't Forget the Ball Park and the River Walk - from a fixBuffalo reader this afternoon. It's yesterday's post from a Wharton business school blog that focuses on the intersection of urban life and real estate values. In the late 19th and early 20th centuries, major cities across America created massive Beaux Arts public spaces -- from the Benjamin Franklin Parkway in Philadelphia to the fabled White City of the Chicago World Exposition in 1893 -- as part of a City Beautiful movement aimed at putting a clean and positive face on the nation's rush toward urbanization. At the end of the 20th century, with those same cities under siege from a rapid loss of manufacturing jobs and suburban flight, urban planners again looked to salvage cities by improving civic spaces, but now with a more commercial bent toward attractions like new ballparks, aquariums or shop-lined river walks. I've been slighly navigationaly challenged in working through some issues on this little - now four year old - neighborhood blog. Like other blogs, I should have a current comment stream somewhere in the sidebar to facilitate more organic interaction. I hope to have that up and running at somepoint soon. In addition to some enhanced connectivity, I'll be saving links that readers send in here - fixreaders - over in my delicious bookmarks, which is about the coolest way to collect and share bookmarks. I'll collect them in a post periodically, too. fixBuffalo readers might remember this post about an amazing ballpark, right here in the neighborhood. I rarely write about other cities. Detroit is an exception. 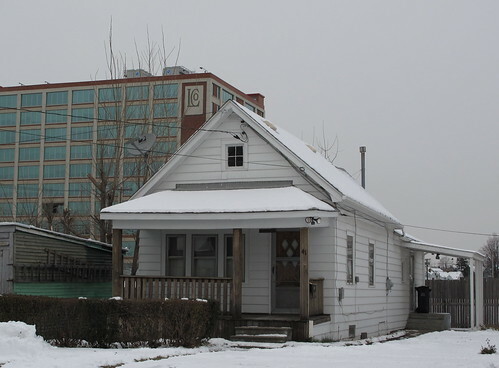 Last year I posted about Rebecca Solnit's - Detroit Arcadia - and the Shrinking Cities show at Cranbrook - and was looped into a conversation about Model D and ended up with this video and Stalking Detroit. I remember as a kid making the trek to Detroit countless times to visit family for the holidays. I've been back twice in the last 15 years, never with a camera. I finished In Michigan: Still Waiting for the Renaissance in the latest issue of Time and spotted this slide show - The Remains of Detroit. While living in one of the City's poorest census tracts and most hollowed out neighborhoods it's sometimes difficult conceptualizing and getting my arms around the loss that's Detroit. It seems mythic. I remember Woodward Avenue - great site. I'll have to go and see what's left. Making plans. Main Street Loft - For Sale, again! While walking the neighborhood this afternoon, I noticed a new 'for sale' sign at 1718 Main Street. I just got off the phone with Dirk at Guerny Becker and Bourne. Here's the lisiting. Located on the west side of Main Street, just south of Lafayette in the Midtown Main market, is a unique opportunity for a magnificent mixed commercial property. The site consists of two separate buildings: the first is the two story front building constructed during the dramatic Pan-American Expo period which includes a 3,210 square foot retail/gallery space and a 4,200 square foot second floor loft residence. 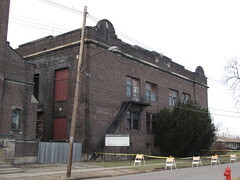 The second building was built thirty years later in 1930, is located directly behind the first and currently serves as the ultimate workshop. I posted about this amazing space in February 2007 - right here and linked to a March 2007 Buffalo Spree article - An Architect's Loft - about the place. Last January I attended an art opening downstairs, stayed way late and hung out upstairs and shot pool and drank the night away in a fabulous workshop space. According to City records, 1718 Main Street was purchased in 2001 by the current owner for $50K. Fast forward seven years later and today, place has been on the market for three days, asking price is $435,500! Open house is scheduled for next Friday, December 19th. I've got a ton of cool iPhone pics from that party, but will have some additional pics and will update next Friday. 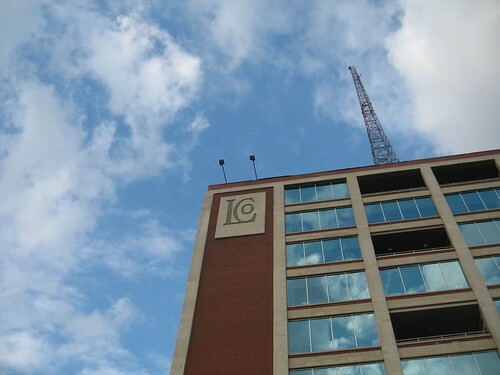 While scoping Gureny Becker & Bourne listings, I spotted this place - crazy concrete building - over on Northampton Street near the old Wonder Bread building, which would make for an amazing live/work location. 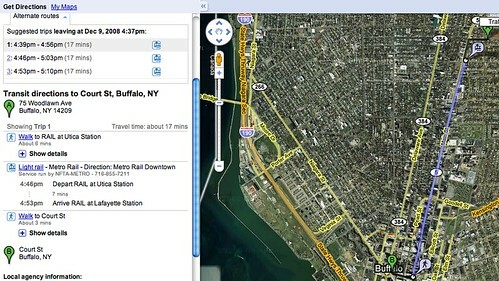 I just learned that our very own NFTA has mashed-up with google! It's so easy to use. When you've located your spot on google maps simply do the 'from here' routine and select 'public transportation' as your way to go. I generated the following map, and travel times for a meeting. I haven't quite given up on the car, thinking about it all the time. One of the reasons why I located a block from Main Street was to take advantage of the City's subway. Two years ago I rode around the City the bus/subway on a month pass. It's still the preferred way for meet-ups and events along the City's spine from downtown to UB. Great deal for $66/month. The alternative right now might be some Suomi snows for my bike. 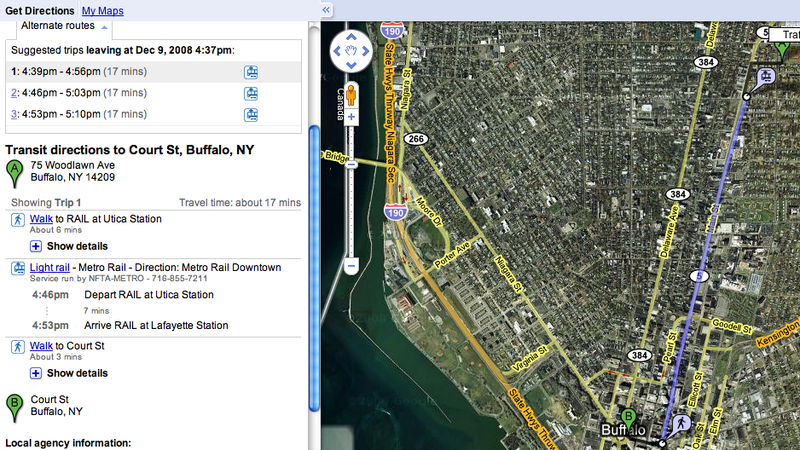 Like to know if anyone else is using this NFTA/google mash-up for getting around town. Very cool. 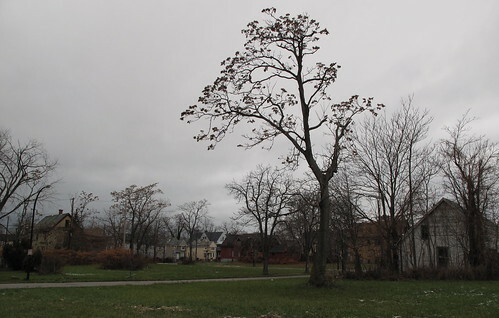 I walked down to the end of my street the other day - Woodlawn Avenue - and noticed that 8 houses have been demolished. 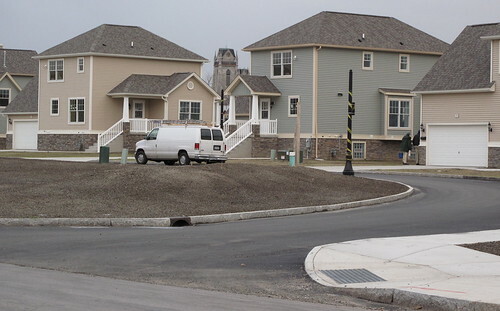 Suburbs in the City from July 2008, begins to tell the story of $4-5 million dollar project that True Bethel has undertaken at the far end of Woodlawn Avenue. 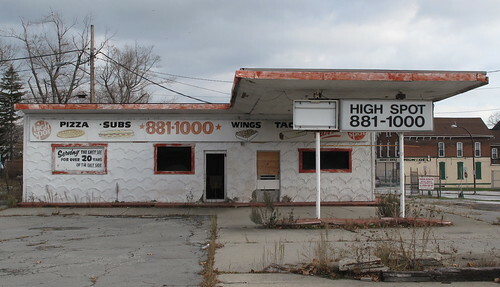 In my first post - Suburbs in the City - there are a number of links to pics, maps, environmental concerns and a rather interesting comment stream over at Buffalo Rising about the project. I can't seem to locate any renderings or project site plans and there's no mention of this project on True Bethel's website. 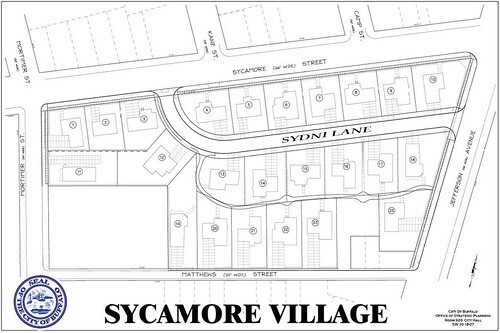 As in the case of Sycamore Village, I'm wondering about the migration to this new development. Will residents here come from other places or leave behind a house somewhere here in the City like a game of musical chairs? Interesting dynamic, no doubt. I spotted some papers tacked to the boards here at the former Freddie's Donuts the other day. Have to double check with City Hall tomorrow but I think it's a demolition. Sign on the building still says - always open. We'll see. Last time I posted about Freddie's was, September 2006. Local photographer Karl Josker has a great thread about Freddie's - right here. As a kid in the suburbs I remember picking up donuts for school fund raisers here at Main and Michigan. I've looked all over for pics from back in the day. Anyone? 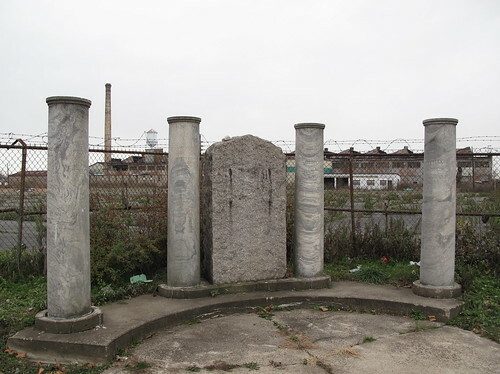 I first noticed this forgotten Four Freedoms momument late last summer while exploring a number of the City's most toxic spots along Northland Avenue. Sort of an interesting moment, the broken monument, located against the abandoned Curtiss-Wright factory on Northland Avenue. There was so much promise and innovation happening in this part of the City. 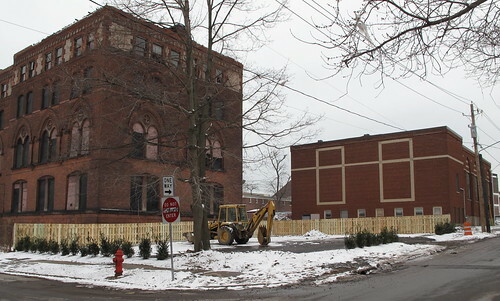 A block away is the now failed Houdaille Industries, which has just become the City's newest EPA superfund site. When President Roosevelt delivered the Four Freedoms address in 1941, Buffalo's manufacturing and population base had yet to peek. Six years later the largest gathering ever in the City of Buffalo would assemble in Delaware Park, see Catholic Buffalo - 200K people gathered in Delaware Park to celebrate. Today we are still losing people, hemorrhaging actually - 7/day - according the Census numbers. Said otherwise, every week a bus load of people leave and anecdotally it seems like a car load returns. And industry? When I began conceiving this post during Thanksgiving week, I snapped this pic down on South Park Avenue, the last remaining smoke stack industry left on this part of the planet. In a twisted way when I grabbed that shot on Thanksgiving Day, it was cold and dirty and the smell reminded me of some time I spent in Berlin East, back in the 80's. Later and while looping back and forth between sucessful European models incorportating and repurposing older industrial structures, I was struck by the thought of another building down by the river that reminds me in some respects of the Tate Modern in London. Crazy and cool loft possibilities. 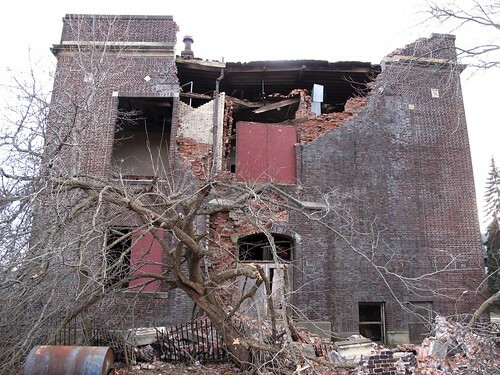 Anyway, if you head over to Northland Avenue you'll see the the structural remains of the Curtis-Wright facility, crumbling and fading as memories inevitably do. 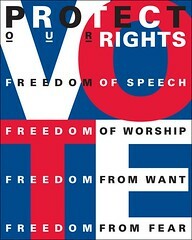 The Wolfsonian-FIU, located in the heart of Miami has an amazing blog in part devoted to the interpretation of the Four Freedoms - Thoughts on Democracy - and many of these posters - great flickr series - remixing Roosevelt's Four Freedoms along some groovy graphic lines are worth checking out. 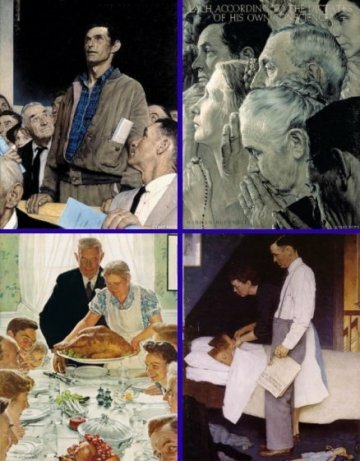 These images are miles away from how Norman Rockwell in 1943 first illustrated Roosevelt's address. The same four freedoms formed the basis of the Universal Declaration of Human Rights, the most translated document in the world, according to the Guiness Book of World Records. According to City records, this monument is located on private property. Who's responsible for maintenance? Are other momuments like these at the corner of Grider and Northland - like houses that are shipped off to landfills - quietly disappearing into the night? If you have a chance to check out the Hydraulics with Chris Hawley - do it! I had the unexpected opportunity to hang with Chris for a few hours in this amazing part of the City on Saturday afternoon. We walked along Roseville Street [google map] and admired some of the coolest cotteges in the city. Chris introduced me to a warehouse building designed by Buffalo's own Louise Bethune and later we ended up at Sharkey's and heard some crazy stories about growing up in the Hydraulics. Very cool spot with neighborhood pics on the wall from back in the day. I'll be heading back and keeping track of what I see in my Hydraulics flickr series. Really, a place to explore. Boards at Artspace - How Long? Aside from Lourdes Church, this is the only building boarded on Main Street in Midtown. 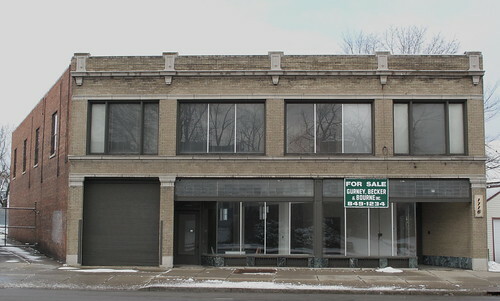 Artspace bought 1217 Main Street in March 2006 for $50,000. A year later they had some problems with building permits here and with falling bricks. Two and half years later and it's still boarded. Why? Always thought an art-centric incubator like this would be amazing upstairs, coffee shop or vodka bar down. Any other ideas out there? Slightly to the south of City Honors is an entire city block with seven structures left, six houses and a former gas station. I walked around the other day after looking through the flickr stream that the folks at UB posted about UB2020. This pic caught my eye as it seemed to indicate that Kaleida Health wants to expand, again. I covered some of their recent expansion here - October 2006. This time the following houses are slated for demolition. Kaleida Health is hoping to receive state approval next week on a 300-bed skilled nursing facility adjacent to the Buffalo Niagara Medical Campus. The state Hospital Review and Planning Council is set to consider Kaleida’s certificate-of-need application at its Dec. 11 meeting. The project was recommended for approval by the project review committee in late November. The certificate of need must be approved before the project can be built. The proposed facility at Michigan Avenue and North Street will include 200 long-term-care beds, 40 memory-care beds, 30 subacute-care beds, 20 pediatric-care beds and 10 ventilator-care residents’ beds. The design calls for four connected buildings, each with four stories, and an outdoor greenspace for residents and visitors. Pending state approval, site work is slated to begin next March, with completion and occupancy by May 2011 – in time to meet the state’s deadline for shutting down Millard Fillmore Gates Circle Hospital [read the rest]. Interesting push East across Michigan Avenue. Kaleida's plans would line up with additional developments in the immediate neighborhood at the North/Michigan intersection. See - The Suburbanization of Michigan Avenue, July 2006 - and of course on the other corner is the new $40 million City Honors project. Quick reminder about Saturday's Artspace Neighborhood walk. We start at 9am and leave from the Sonic Cafe, right across from Artspace. Plan on an hour or so. Here's this season's slide show or see them all at once in - Walking around Artspace on flickr. Here's the schedule for the rest of 2008, rain snow or shine. Meet-up is at the Sonice Cafe at 9am right across from Artspace. Here's the map. I've been digging flickr for the longest time, an amazing way to share and host pics and an equally amazing way to network and trade takes on the what we see here in Buffalo and around the world. I spent part of the day rearranging pics and posts and noticed that a flickr series I've been adding to for the past few months - the red mark of death - now has over 8000 hits! The series captures an interesting moment involving dereliction/demolitions/spray paint and the slow moving erosion of residential structures here in the country's second third poorest city. Everyweek I'll link to a Buffalo series or slideshow from my growing list of flickr contacts. This week's is from Jason in Toronto, find him here and check out his cool slideshow - Buffalo 2008. If you're thinking about flickr as a way to share pics, you might be interested in the following set of flickr tools. Always something interesting to use. A few cool flickr groups that might be of interest include - Buffalo • Buffalo & WNY • Buffalo Street Photography • Guess Where Buffalo • Buffalo Type - really amazing views that you might otherwise miss. I carry the new Canon G10 just about everywhere. What are you shooting with? What's your favorite Buffalo flickr shot? I've added twitter towards the top of my sidebar. Over the weekend I was talking with friends about the value of this technology to capture breakneck events and other timely stories. I signed up yesterday and added twittelator to my iPhone to get all synced-up. Just finished reading this post - How Should Journalists Use Twitter? - posted hours ago on the Columbia Journalism Review blog. Very cool. So, follow me on twitter! Here's the official invitation to participate in a community meeting on Wednesday December 3rd for a full discussion regarding the future of the most interesting and perhaps least understood part of the City, it's past and promise. Buffalo Rising covered it here. So...imagine for a moment - a discussion about Delaware Park, without talking about down-grading the Scajaquada Expressway. Or, imagine for a moment a discussion about the possibility of East side revitalization that doesn't include a discussion regarding the feasibility and necessity of decking the 33. Impossible, right? Well the same thing is happening here. Route 5 is not part of this plan! It bisects this part of the planet! How can a 'master plan' for the area not even mention this 800lb gorilla? Covered by B/R in October 2007 - Will the Ghost of Robert Moses Continue to Haunt Us - (do a search for 'waterfront coalition' on buffalorising to get up to speed) I find it almost insulting that the BOA planning area conveniently ends/begins at route 5. I've driven this construction site all summer and fall with a rather intrepid critic of this process and we've been continually miffed and upset by the wholesale lack of integrated and regional planning for this part of the planet. If the current re-construction of route 5 continues reasonable planning for the rest of this area will be negatively impacted for decades. It will take generations to undue what we can still stop today. Nationally, Congress for the New Urbanism has endorsed the boulevard option, right here. Locally, Julie Barrett O'Neill, Executive Director of the Buffalo Niagara Riverkeeper (follow that link for updated current legal action) is featured in the following ten minute video explaining why we can't wait. Prior to the meeting please take a moment to familiarize yourself with the planning documents that are available here on the City's website. Particular attention should be paid to the draft document - Analysis of the Proposed BOA - September 2008 [.pdf files after the jump] that's been compiled and written by Urban Strategies, Inc. - a Toronto based urban planning and design firm. I've learned that they're receiving $600K+ for this work. It's a short 100pp document with two rather interesting appendixes. I've spent a good deal of time exploring and photographing this part of Buffalo with artists and photographers from Berlin to San Francisco. Really amazing space. 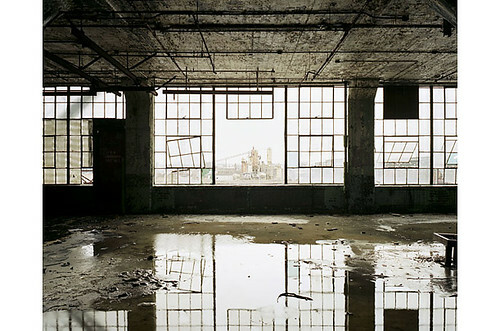 The industrial landscape is fading away and the last remaining physical elements of this place - a place that is so infused with the City's ethos and industrial past and promise - are being reduced to dust or shipped off to China as scrap, right now. Globally there are some amazing models out there including Emscher Park in Germany that could be embraced here and now when thinking about this space and planning its future use. 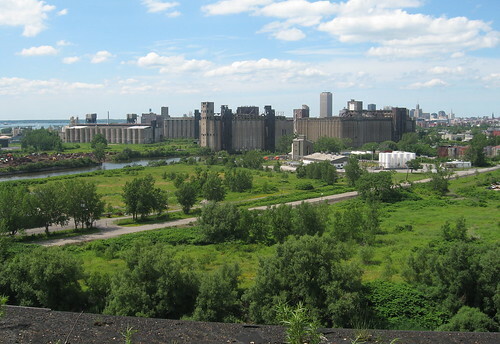 ...you can see the land in question encompasses both Tifft, the Buffalo River and the lands surrounding the grain elevators - elements unique to Buffalo's connection to the past and future. One only has to take a boat down the Buffalo River on a summer day to see the potential of this place. 1900 acres is a lot of land. As the article asks - what kind of city do we want? A city with access to our resources? A city that serves it's citizens? A city that serves the special interests of a few? A city that can move into the future with vision rather than short-sightedness? Without public input who will decide? By creating two planning areas - the 'outer harbor' and the south Buffalo BOA - the community and the City are being divided - by a highway and the Brown administration that continues to possesses and impose a myopic view of Buffalo's future. It's text book, divide and conquer. Or, where's the strategic, long-term regional planning that should include other parts of the area - Bethlehem Steel, for example and the brownfield remediation that's happening there that Tecumseh ReDevelopment is completing. It's a stone's throw a way from this 1900 acre South Buffalo BOA planning area. Why are we competing with the City of Lackawanna for scare resources now? Could the cash being pipelined for this area be used more effectively in other parts of the second third poorest city in the country? So many questions. As we prepare for Wednesday evening, let's remember Jane Jacob's life and work. It may be that we have become so feckless as a people that we no longer care how things do work, but only what kind of quick, easy outer impression they give. If so, there is little hope for our cities or probably for much else in our society. But I do not think this is so. Meeting begins at 5:30pm at the Buffalo Irish Center, 245 Abbott Road. The neighborhood is really so quiet on a holiday, more than usual. I walked down Michigan Avenue to Laurel and wound my way to Masten Park. I walked by a number of places that had been demolished during the past year that shouldn't have been and a number of places that should have been demolished and haven't. 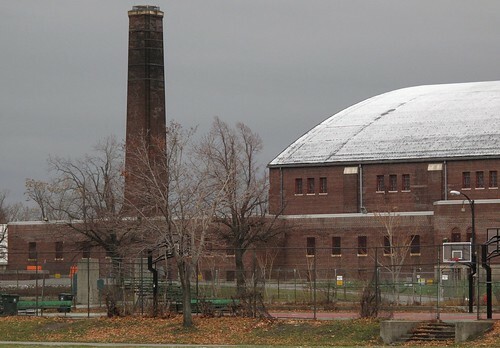 The Masten Armory is such an imposing place while Masten Park, built on top of a former reservoir that provided Buffalo's drinking water, offers some amazing views of the City. Here's a few more pics and places that caught my eye while my fingers froze on this November afternoon. 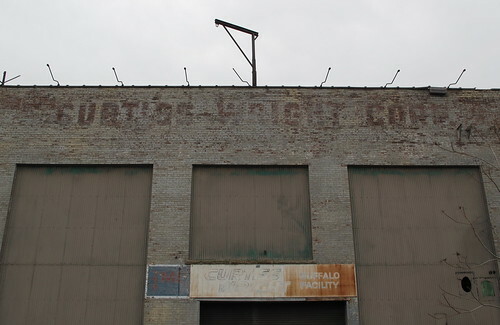 fixBuffalo readers may remember a series of posts about 204 High Street (google map). 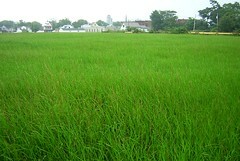 I first visited this place more than two years ago here, in September 2006. It's a fascinating spot, located one block from the medical corridor. 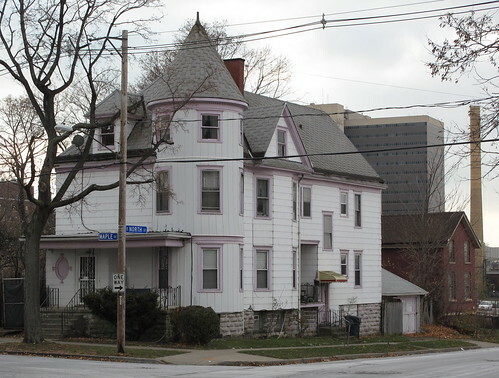 204 once housed a physician's office along High Street and an attached residence on Maple Street. While checking on some UB2020 and Kaleida Health developments in the neighborhood the other day, I took a closer look at 204 High Street. Two years later, it's still standing. I've shown this place to a handful of people who've been interested in re-locating to this part of Buffalo. 204 High Street was part of a special City auction in September 2007. It sold for $3800 yet the deal never closed. According to City Hall, it's still available. If you're interested, let me know. There's some interesting new development happening just blocks away - UB2020 and City Honors. Here's a 204 High Street flickr series. 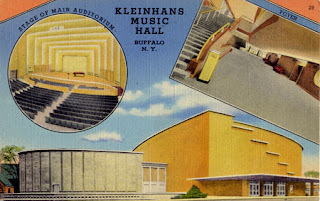 Buffalo NY's newest blog - The Hydraulics - is out. TheHydraulics.com is a blog devoted to news, people, places, histories, ideas, and events related to the Hydraulics, Buffalo's oldest manufacturing district and one of America's most important industrial heritage sites. My name is Chris Hawley. I'm an urban planner and amateur historian who has taken a strong interest in the history and future of the Hydraulics. I work for Howard Zemsky, the investment guru whose vision transformed the vacant Larkin Terminal Warehouse into one of the most successful Class A office buildings in Western New York. I do special projects - whatever lands on my plate. As part of my effort to write a comprehensive history of the Hydraulics, I thought it would be a cool idea to leapfrog that effort into a regularly-updated blog on all things related to the neighborhood's past, present, and potential future. For more information, visit the introductory post on the Hydraulics and, of course, frequent the blog! fixBuffalo readers already know the author, Chris Hawley. He wrote Midtown: Poised for Renaissance, a planning piece that's played a pivotal role in shaping the dialog around one of Buffalo's emerging new neighborhoods - Coe Place and Midtown. If you do flickr, see what Chris sees with his camera right here. It's not often that you meet someone that helps you really shift what you see. This past summer I met a retired professor who reminded me about the value of perspective, how we see things. I've reflected on that meeting so often since and holding that lesson rather dear I ventured out the other day looking for a vantage point, a different place to see what I've seen hundreds of times - this Midtown neigborhood. I walked into a parking ramp, climbed the stairs and started shooting. Here's our Lady of Lourdes, on Main Street. fixBuffalo readers may remember the recent auction at Lourdes this past September - right here. Sort of crazy shot, right? Slightly odd, visiting a parking ramp with out a car. Anway...this afternoon I unexpectedly met up with the person who introduced me to that professor and we revisited the same lesson about perspective, vantage points - seeing the city as co/conspirators - and the importance of witnessing this place, our city, hemmorage and slowly maybe slowly piece its way back together from the brink. We need to be deliberate. Meanwhile, I'll be visiting a few other parking ramps on the City's east side and keeping track of my ramp shots. As I compose my shots I will be remembering those lessons and words I heard this summer and again this afternoon. This is an educational and outreach effort, intended to help build awareness and consensus around the issue of form-based zoning in the City of Buffalo. The focal point of the project is a presentation and lecture which is being shown to local leaders and community groups. An online version of the slideshow is also part of this website. Please check the Newsroom for related news, scheduled presentations, and other events. If you’d like your organization to host a presentation, please feel free to contact us. There are many other resources available on this website. Check the Resources page for links, documents, and downloads. 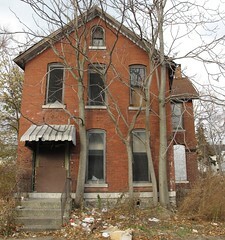 I'd forgotten about the vacant properties database the Buffalo News compiled recently - right here. You can search properties by street, street number and property type. Results are displayed in a modifed spreadsheet. The only down side at this point is that the results aren't displayed in a graphically interesting way and lack the searchableness of a google map mash-up. If anyone has more information about some of the metrics used in compiling this database and whether it's updated on a continual basis, let me know. Just how helpful is this? I missed the opening. Nice garage! 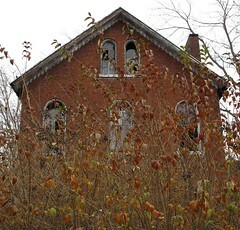 Don't miss the thread at SpeakupWNY about Sycamore Village - right here. While I'd never begrudge anyone an affordable, clean and decent place to live - sometimes you just got to wonder where the priorities are, or in this case, where they've been. The point is this. Closer to the downtown core along so many blocks between Genesee and Broadway and west of Jefferson, there are neighborhoods that were started years ago with some of the most amazing residential urban infill we have in the city. There are streets lined with modest brick duplexes and singles. 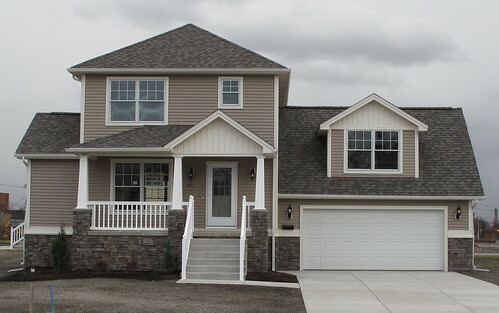 Houses that fit the city and streetscape and routinely sell in the $60-80K range. Between many of these houses are gaps that need to be filled to create the sort of urban density that could potentially attract retail and commercial development. Simple. Instead, City planners leap frogged that area and built houses that are ostensibly designed to lure suburban residents to the city and in this case, away from the core and away from downtown. While cool houses like this - corner of Monroe and Sycamore - were demolished to make room for the first phase of these heavily subsidized new builds, it will be interesting to track what the new residents are leaving behind when they move to Sycamore Village. Many veteran observers have told me that new builds along William and Clinton Streets are directly linked back to areas of the city like Hamlin Park - a game of musical chairs. No doubt an interesting trend, where one part of the city grows at the expense of another. The other long term issue that's looming has to do with environmental issues involving the site's remediation. For the first time I spent some time this afternoon in the Hickory Woods neighborhood, off Hopkins Street. In August I visited Love Canal. Twice in recent memory municipalities have pushed and marketed housing on contaminated sites. Any thoughts on what the story here at Sycamore Village might be in the years ahead? The other issue is the immediate area's new build foreclosure history. I covered part of that disturbing trend here and here recently. New builds available for the second time around are selling for a fraction of their original sale price! Lots of questions - why here, when the actual construction costs exceed $205,000/house - and no answers. 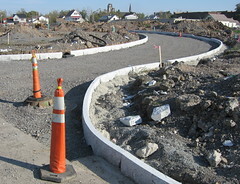 Here's a flickr stream - Sycamore Village - with site construction pics.